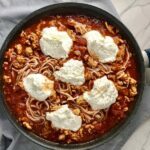 This Skillet Ground Chicken Tomato Sauce with Ricotta is a delicious and simple one pan meal. 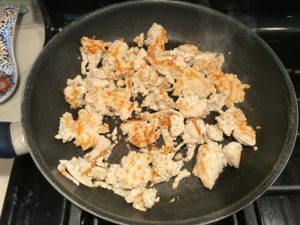 Ground chicken is seared until it gets a super browned, flavorful crust. Then garlic, vegetable broth and tomatoes are added. 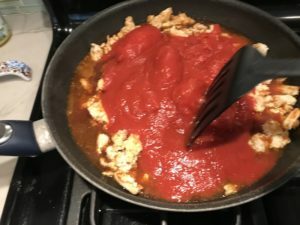 All of this cooks down into a delightful sauce that really lets the tomato shine with a meaty bite from the chicken. After pasta is mixed in (I used Gluten Free), creamy Ricotta Cheese and fresh basil are added. It’s perfection! Bellissimo! Italian food always seems very romantic to me. When I think of Spaghetti, I think of Lady and the Tramp. You know the scene sharing the pasta and kissing – yes, I am a bit of a sap. So, Italy was a natural choice for my honeymoon over 10 years ago. For our 10th Anniversary, this past July, Dave and I decided to go back for some much-needed romance. I mean, having kids takes its toll in the romance department – am I right? The trip was absolutely amazing. I will be sharing a complete review of everything we ate in Italy with tips and recommendations very soon! I already developed an amazing Walnut Sauce with Ricotta & Spinach Pasta Recipe inspired by a dish I ate in Cinque Terre. 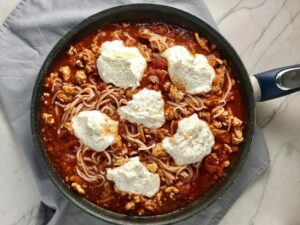 Let’s Make this Skillet Ground Chicken Tomato & Ricotta! This recipe is so simple, that there isn’t much to do ahead of time. You can mince the garlic and rough chopping the basil leaves. You can also just leave the basil whole for garnish at the end. 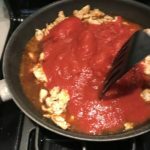 You can also make the ground chicken tomato sauce in advance and store it in the fridge. 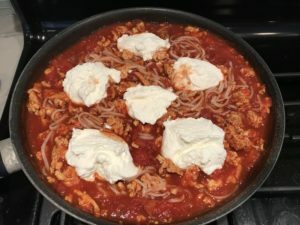 Then on the night you are ready to eat it, heat it up in the skillet, add the spaghetti (or gluten free pasta as I used) and the ricotta. 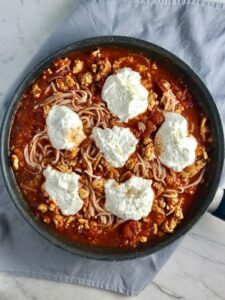 For this recipe, I used gluten free rice noodles, which really act like spaghetti. There are a lot of different gluten free pastas available now. Make sure the GF Pasta is sturdy enough to hold up in the sauce and that you do not overcook it. , so that it doesn’t turn to mush in the sauce. I find the rice noodles cooked al dente hold up really well. 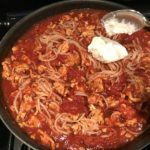 Of course, you can always use regular spaghetti for this! 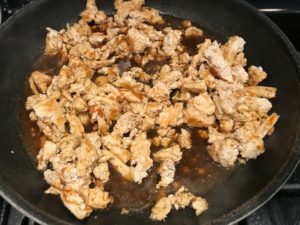 Once the ground chicken is really browned and the garlic is added, add the broth. 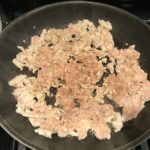 As you add the broth, scrape the bottom to pick up all of those yummy brown bits stuck to the skillet. Those brown bits will give your sauce great flavor. I used Better than Bouillon Vegetable Base broth in this dish because I love the deep, rich flavors it brings. You can use any other chicken or veggie broth you like. Now, for the tomatoes. 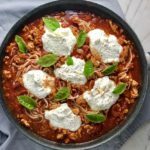 This is a quick weeknight meal, so I recommend using sweet, full flavored canned San Marzano Whole Peeled tomatoes. When they are cooked whole, you know they have retained as many of the vitamins and nutrients as possible in the cooking process. You can break them up easily for a textured sauce with pieces of the tomato, which I really love vs. a pureed tomato sauce. For the Ricotta…you could certainly zhush up the ricotta with herbs or garlic. However, I love the simplicity of leaving it plain so that it allows the sauce to still stand out and just add a creamy texture to it. Add as much or as little as you want in dollops into the sauce. Serve it in bowls or dishes and then simply garnish with fresh basil. 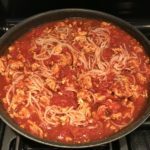 This Skillet Chicken Tomato Sauce with Ricotta and Pasta is a delicious and simple one pan meal. 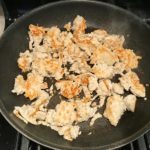 Ground chicken is seared to get a browned, flavorful crust. 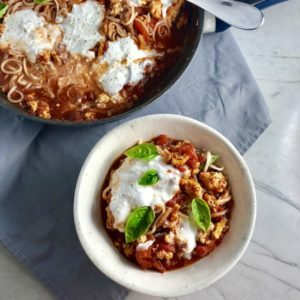 Garlic, broth & tomatoes are added & cooked down into a delightful sauce with a meaty bite from the chicken. Pasta is mixed in, then creamy Ricotta is added. Bellissimo! Mince the garlic Clove. Rough chop the basil leaves - or just leave them whole for garnish at the end. 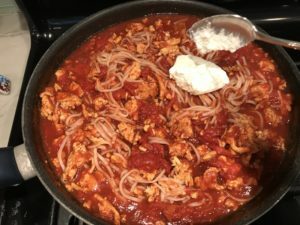 Make the spaghetti to al dente according to package instructions then set aside until you are ready to add to the sauce. NOTE: you do not want to over cook the pasta as it will continue to cook in the sauce. Preheat a large skillet on high heat. Add 2 tsp Extra Virgin Olive Oil and spread it around the skillet. 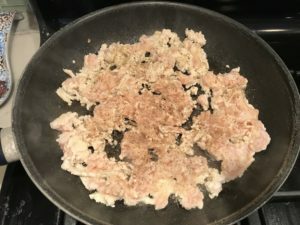 Add the ground chicken, break it up and make a single layer of meat so that all of it can get a nice brown sear. Now add the minced garlic and stir to combine and cook for 1 minute. 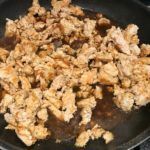 Add the Broth and stir to get all of those delicious browned bits off the bottom of the skillet. Add the tomatoes and break them up with a spatula. Mix to combine. Cover and simmer for 5 minutes. TIP: If you do not have a cover for your skillet, you can use a sheet pan or just aluminum foil. Now mix in the spaghetti and mix using tongs so that all of the sauce combines with the pasta. Finally, add in some hefty dollops of creamy ricotta cheese. You can add in as much or as little as you want, but I like to scoop out 1-2 dollops per serving. Serve and garnish with basil. 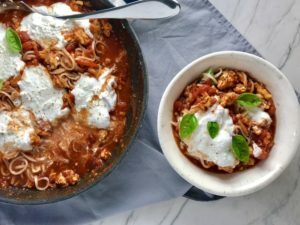 This recipe is intentionally simply and short on herbs because I really wanted to let the natural sweetness of the tomatoes and the browned flavor from the chicken be the star. The basil at the very end as garnish is a nice fresh burst of flavor. However, feel free to also add basil to the sauce and mix it in before you cover it to simmer.